Darrick and I spent our honeymoon at the Queen Elizabeth II Hotel in Montreal. It is a lovely, if non-descript concrete box of a hotel in the new part of Montreal's downtown. It is famous because it is the hotel where John Lennon and Yoko Ono held their famous bed-in for peace on their honeymoon in 1969. Their room was just down the hall from ours, with a discreet little brass plaque on the door. 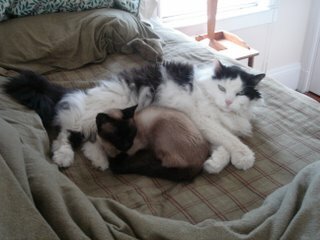 This photo of my cats reminds me of photographs I have seen of John and Yoko during their bed-in. It's also a good photo of the size difference between the two of them. Oberon is a cat of substance, and Diva is just little all around. They've been staging daily bed-ins for nearly 14 years, and have generally gotten all of their demands...mostly pettings and food. The Levitical codes are pretty clear that usury is a crime. That is, the exchange of one form of currency for another for profit, (and by extension all profit associated with banking, etc.) is forbidden. Of course Leviticus was referring to the exchange of Roman coins for Temple coins that were the only acceptable form of money for the purchase of sacrificial animals for the Temple. I am thinking that this bit of Leviticus is not so bad. Today, I paid my tuition bill for Oxford. 3536 GBP = 6140 USD. It cost me 35 USD just to make the bank transfer, and I am sure that Barclays Bank in the UK made some money on this exchange as well. I don't mind paying fairly for things like food and books and education, but I can't help feeling like an economic exchange rate this poor is not so much fun. I'm just checking in with any readers who might still be there. Posts will be rather sparse until I've left for the UK in May. We are at the height of the busy season at Marsh Chapel...if the Christian church has thought of a worship service in the past 2000 years, we will probably be enacting some version of it during Holy Week at Marsh Chapel. It is a fascinating ministry, where we have Christians of all stripes from across America and indeed the world who view Marsh Chapel as their spiritual home while they are at Boston University. I get to be particular about my own beliefs, but by virtue of being a University Chaplain, I get to interact with the fullest spectrum of religious beliefs on a nearly daily basis. One of the things I avowed at my ordination was that I would minister to people of faith, people of different faiths than my own, and people of no faith equally. I get to do that every day! That's all for now. When the battery to the camera recharges; some fresh cat blogging!